One Saturday morning Abby's Mum came upstairs to see Abby in her bedroom. Or tried to. There was so much mess on the floor she could only poke her head around the door. Abby sat in the middle of it all reading a book. "What a tip," Mum said. "You need to have a clear up in here." "Why?" Mum repeated. "Because things get broken or lost when they're all willy-nilly like this. Come on, have a tidy up now." "But I'm very busy," Abby argued, "and it's boring on my own. Can't you help me?" "No I can't, I'm busy too. But I'll give you extra pocket money if you do a good job." When Mum came back later all the toys and clothes and books had disappeared. "I'm impressed," said Mum. "But I'll inspect it properly later." "It was easy," said Abby. "Can I have my extra pocket money now?" "All right. Get it out of my change purse. 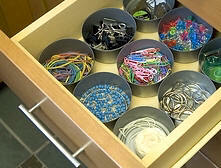 It's in the kitchen tidy drawer." In the kitchen Abby went over to the dresser and pulled open the tidy drawer. She hunted for the purse. "It must be lurking at the bottom," Mum said. "Let's have a proper look." She pulled the drawer out and carried it over to the table. Abby kneeled up on a chair to look inside. There were lots of boring things like staplers and string but there were lots of interesting things as well. "What's this?" Abby asked, holding up a plastic bottle full of red liquid. Mum laughed. "Fake blood, from a Hallowe'en party years ago. Your Dad and I took you to that, dressed up as a baby vampire. You were really scary." Abby carried on looking through the drawer. She found some vampire teeth, white face paint, plastic witchy nails and hair gel. Mum pulled out a glittery hair band. It had springs with wobbly balls on the top that flashed disco colours. She put it on her head while she carried on looking through the drawer. Abby found some sparkly hair elastics to match the hair band. She made her Mum put lots of little bunches all over her head so she looked really silly. "I remember this," Abby said as she pulled out a plastic bag. "This is from my pirate party." Inside there was a black, false moustache and some big gold earrings.